What can I send to Belgium? What items are restricted? If you’re hoping to take part in some of the outdoor activities on offer in Belgium, you may require more baggage than is allowed by a typical airline. Weight limitations and baggage allowance may make it difficult for you to pack your favourite, but heavy, pair of hiking boots and equipment alongside your usual luggage. Or, you may have outsized equipment, such as kayaks, oars or hiking sticks that you wouldn’t be able to carry with you on the plane. If these things are a necessity for the enjoyment of your trip, then you simply can’t be without them. Send My Bag can ship your problem luggage directly to your door, with everything being taken care of for you. Perhaps you’re planning a longer trip, moving away to the fascinating country of Belgium or you may simply want to avoid the queues and hassle of baggage drop off and pick up at the airport, as well as the possibility of excess luggage fees. In these cases, Send My Bag will be perfect for you, with a simple and easy to use service which takes your luggage from door to door. Many students choose to spend time in Belgium during their third year abroad, whether studying on the Erasmus+ scheme or working as a language assistant teaching English in a Belgian school. In this case, students need to send several bags to Belgium in order to set up home there. This allows them to have many more of their things with them than if they only brought what they could check into the plane's hold (at considerable cost). You can send your luggage and boxes to Belgium with Send My Bag. If you are taking a short break in Belgium, if you are working or studying there for a year, or if you are moving there permanently, you can save yourself a lot of stress by sending your luggage with Send My Bag. This means you can bring lots of your favourite things with you to make you feel at home in Belgium. With your luggage taken care of, you can focus on discovering your new surroundings. To learn more about sending luggage to Belgium, visit our ‘How it works’ page, or our ‘FAQs’. Despite being a small country, Belgium has many great golf courses, such as Royal Zoute, Limburg and Royal Belgium. If you want to sample some of these courses, you can do so using your own clubs. You can avoid oversized baggage fees from your airlines by sending your golf clubs to Belgium with Send My Bag. This will make travel to Belgium much easier since you won’t have to wait around at bag drop or luggage carousels, or have to drag large golf bags with you onto public transport. See further information on how to send golf clubs with Send My Bag, including how best to package your golf clubs. Cycling is very popular in Belgium, particularly in the Flemish region, due to the generally flat landscape. If you want to enjoy a cycling holiday in Belgium, you can send your bicycle with Send My Bag and enjoy cycling through Belgium's flat and gentle countryside. Sending your bike to Belgium is much easier than checking it into the hold of your plane. You will avoid oversized baggage fees and won't have to carry the bike to and from the airport. Your bike will need to be taken apart and properly packaged before being sent to Belgium. Check out our information on bike shipping to learn more. If you have decided to move to Belgium permanently, you will have to consider international removals to Belgium in order to shift all of your possessions. Before you give anything to the movers, however, ensure that all your items are carefully packaged so that they arrive in one piece. Use suitable packaging for your items and tape everything up well. If you are spending a third year abroad in Belgium, whether studying or working there, you will have plenty that you need to bring with you, such as your course textbooks and many other everyday items, like fiction books, clothes and DVDs. You might decide to take your whole degree course in Belgium, which has several top universities to choose from, such as the Katholieke Universiteit Leuven, the University of Ghent and the Université Catholique de Louvain. Read more about student shipping on our student removals page and find out how to receive your student discount. Sending a parcel to Belgium with Send My Bag is simple. If you left some items at home when you moved to Belgium, you can ask a friend or family member to put them in a box and send them on to you. Send My Bag can send parcels internationally to Belgium for you. Just make sure you choose a sturdy box when sending a parcel to Belgium and tape it up well so nothing gets damaged in transit. Find out more about sending a parcel and learn what you can send with Send My Bag and how to package your items. If you need to send something like a table or armchair to Belgium you could try air freight. This usually takes one to two days, which tends to be faster than sea freight shipping, but typically more expensive. The amount you will have to pay when shipping by air freight is determined by the weight and size of your shipment. You will probably also have to pay for the services of a customs agent to handle customs clearance for you. Another cost is getting your items to and from the airport. The price could, therefore, quickly mount up. If you send internationally by air freight to Belgium your items will likely arrive at Brussels Airport. You could opt for sea freight or container shipping to transport your possessions to Belgium. Since sea freight can take a number of weeks, it is a good option if you don’t need to receive your items immediately. Again, sea freight is normally used when shipping large bulky items, such as a snooker table or armchair, which are loaded onto cargo ships in containers. This option can be less expensive than air freight, but you will still need to pay for the services of a customs agent and will need to arrange how to get your items to and from the ports. This means the cost could be more than expected. When using container shipping to Belgium, your items will most likely arrive by ship at one of the major sea ports, such as the Port of Antwerp, the Port of Ghent or the Port of Bruges-Zeebrugge. The owner of the bag will also be required to upload a copy of their passport onto the booking to allow us to declare the consignment as a Personal Effect shipment. Duty & Tax relief is not automatic; personal effects being shipped must be at least 1 year old. Any new items must be shipped separately under a different consignment number to the Personal Effects, and taxes and duties are to be paid immediately. Most customs authorities consider personal effects to be used items which have been in the sender's possession for 6 months or more, but Belgian authorities require that they are at least one year old. If your bag is checked by Belgian customs and is found to contain brand new or commercial items your shipment may be assessed for customs duties and taxes. If you are sending Christmas gifts to Belgium please check with Belgian customs so you are aware of potential customs duties, follow any advice given and attach all necessary documentation. To show that your shipment consists of personal effects, you will need to complete a brief non generic packing list online, with entries to be made in the following format: "2 x Chiffon Dress, 3 x Jeans, 5 x Pairs of Socks", and so on, rather than as "10 x Used Clothing". Customs processes and allowances do vary by country and so we ask travellers to take 5 minutes to check how their personal circumstances and what they are sending will be assessed under the prevailing Belgian customs regulations. 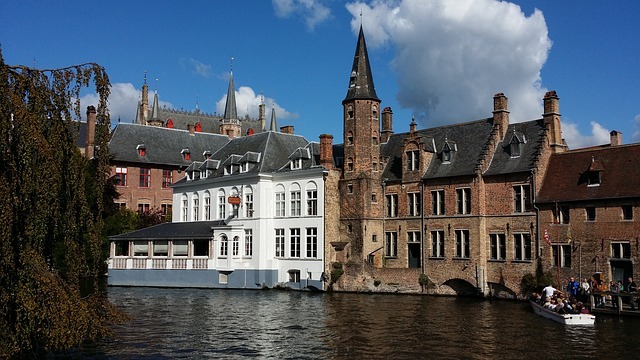 The major cities in Belgium - Brussels, Bruges, Antwerp and Ghent - are known for being of great historical interest. They also offer up some fantastic culinary delights such as the ever-famed Moules Frites - mussels with skinny chips. The country is perfect for a weekend break, or a longer trip to enjoy the various sights it has to offer. Known especially for its history during the war, there are a huge number of battle grounds, museums and grave sites to visit in Belgium. If you’re not so intrigued by Belgium’s history, you at least have to sample one of Belgium’s top draws - its famous beer, of which there are more than 700 varieties to choose from. Or if you want to do something more active, Belgium’s Ardennes offer a huge range of outdoor activities to take part in, from simple hikes amongst its hills and valleys, to kayaking on its winding rivers, and not forgetting, of course, the many cycling routes through Belgium’s flat landscapes.